Ismail Ashraf, assistant curator points at a 12th century pre-Islamic artifact at the Maldives national museum in Male, Maldives, Tuesday, Feb. 14, 2012. The museum is reopening without some of its most valuable exhibits a week after a mob of suspected religious extremists smashed images from the pre-Islamic era of this Indian Ocean archipelago. The mob of apparent Muslim extremists attacked the museum during the Maldives' unfolding political crisis. The country has seen weeks of protests and last week the president stepped down. He later said he was forced to resign at gunpoint. AP Photo/ Gemunu Amarasinghe. 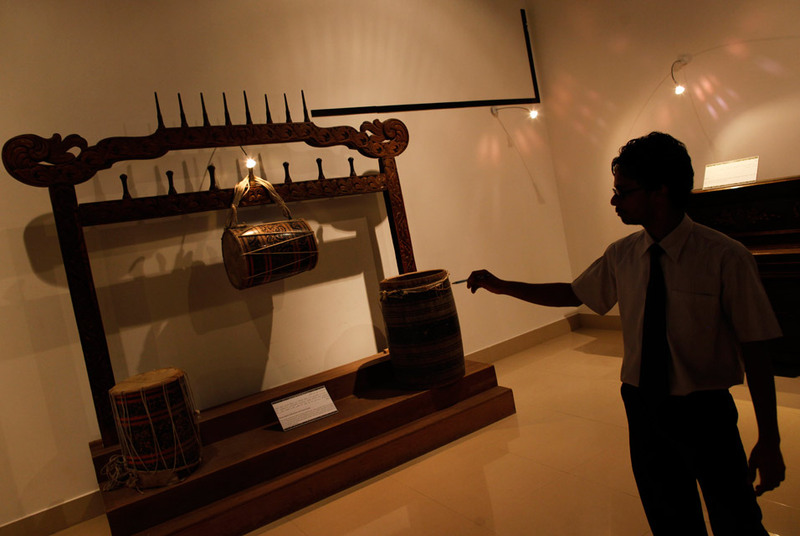 COLOMBO (AP).- The Maldives' national museum reopened Tuesday without some of its most valuable exhibits a week after a mob of suspected religious extremists smashed images from the pre-Islamic era of this Indian Ocean archipelago. About 35 exhibits  mostly images of Buddha and Hindu gods  were destroyed in the attack. Some of the artifacts dated back to the sixth century, museum director Ali Waheed said. Metropolitan Museum acquires Augustus Saint-Gaudens' "The Man (Standing Lincoln)"
Sotheby's finds hidden signature on Jean-Michel Basquiat's "Orange Sports Figure"
Kunsthaus Bregenz exhibition: Can a journal be translated into an exhibition space? Jonathan Prince makes his mark on Madison Avenue with new body of work "states of matter"